Each year we sell thousands of ice rink liners to customers throughout U.S. and Canada. D1 ice rink liners are white on both sides. The rink liner will reflect away the UV rays and keep your ice cold so it lasts all winter long! An all white liner will also help your grass bounce back in the spring compared to an all black liner or a white/black liner. You will want to oversize your ice rink tarp depending on the size of your hockey boards. For example, when combined with D1 Hockey Boards we recommend you oversize the tarp by 5′ feet on both the length and width. 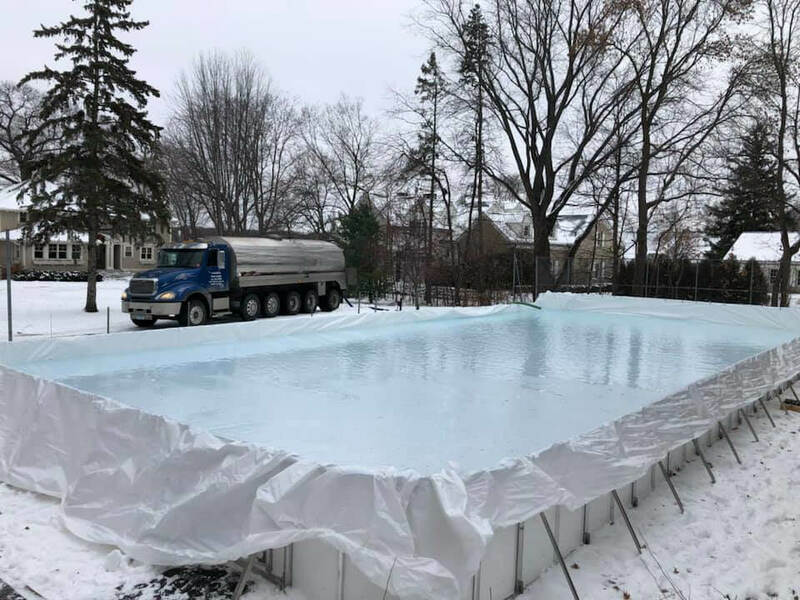 A 30′ x 60′ hockey rink would need a 35′ x 65′ rink tarp. Ordering the rink liner you need for your backyard rink is easy. The lengths of the Liners we offer are grouped below. Select the liner size that works for your outdoor hockey rink. We will cut and ship out your liner the next day! Stand in the center of one end and roll the Liner down the rink. You will need at least 5 of extra Liner on each end and side. For example, we recommend a 40′ x 70′ liner for a 35′ x 65′ rink. Adjust the Liner length as needed. From there, unfold the Liner so it reaches the sides of your rink. Be sure the Liner is bunched up where the Hockey Board meets the ground. This will allow the Liner to adjust with the pressure of the water. What is the quality of D1 Ice Rink Liners? D1 Ice Rink Liners are made from a heavy 6 mil tri-layer poly with ripstop reinforcements to prevent tearing or zippering. We suggest you oversize your Rink Liner by at least 5′. 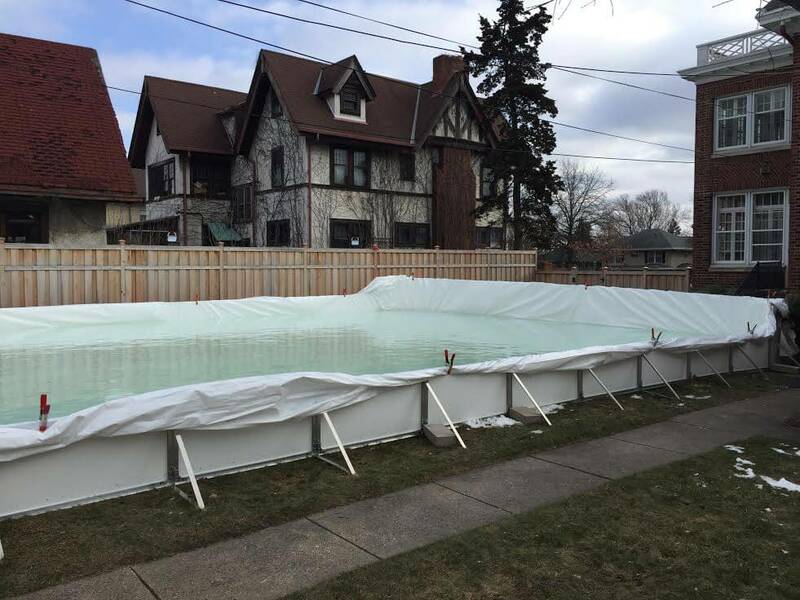 For example, if your winter rink is 35′ x 65′, we suggest you purchase a rink liner that is at least 40′ x 70′. How many years will my D1 Ice Liner last? D1 Ice Rink liners have been known to last 2-3 years. The cost to replace a rink liner is nominal. D1 recommends replacing your rink liner each year unless you are 100% certain the liner is free from holes and tears. Will the Liner cause any damage to my lawn? If the ice rink liner is removed immediately after the ice has thawed, damage to the lawn will be minimal. How do I order my Liner? The best way to order your Rink Liner is online. Click here to order. When will I receive my Liner? We process all Rink Liner orders the same day. The Liners are then cut by hand and shipped out the next day. We ship D1 Ice Rink Liners throughout U.S.A. and Canada.